A satisfying package for Yes and Billy Sherwood fans. 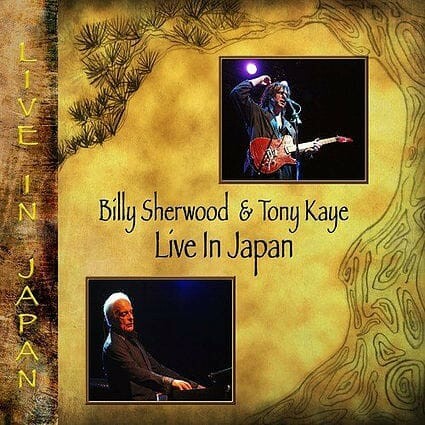 The Billy Sherwood "marathon of releases" continues with this live 2CD/DVD from Sherwood's and ex-Yes keyboardist Tony Kaye's 'Together We Are' eight-date Japanese tour in 2011. Now that Sherwood is back in the Yes fold, it seems timely to put out this package as it is very Yes related. The stage set-up for these shows was Sherwood singing and playing lead guitar and Kaye tinkling the ivories. It may be just the two of them, however, Sherwood had played all the relevant bass and drum parts in the studio and recorded them for the tour, once again proving what a clever multi-instrumentalist (aka smart-arse) he is! The show opens with 'Confess' from the Conspiracy project that Sherwood and Chris Squire put together at the beginning of the noughties; considering there are only two musicians on stage, it sounds pretty impressive. Kaye supplies some great Hammond solos, and Sherwood is in fine voice and his soloing is excellent. Next up are two Circa: numbers from their debut, 'Together We Are' and 'Cut The Ties' are both fine representations of the studio cuts. The title track from Yes' 1970 'Time And A Word' follows and Kaye, once again, lays down some wonderful Hammond solos; it must have been a blast for him revisiting a classic from his distant past. Sherwood must have also programmed in backing vocals as they are quite prominent throughout. A couple more Conspiracy songs keep the flow going, with Sherwood once more showing how proficient he is on lead guitar. 'Fireworks', a Sherwood solo track from 2003's 'No Comment' (and thanks for the tribute to our magazine!) features a stunning guitar solo. The 'Your Move' section from 'I've Seen All Good People' is the next song from the Yes canon and it's quickly followed by 'Owner Of A Lonely Heart', where Sherwood actually manages a decent stab at Trevor Rabin's technically awesome solo (something that Steve Howe has struggled with over the years). The second disc opens with an instrumental version of 'I Am Waiting' from Yes' underrated 1994 'Talk' album and then Kaye treats us to a keyboard solo which features a snippet of 'Changes'. A great surprise arrives next; 'The Other Side' from Toto's 1992 'Kingdom Of Desire' release, which Sherwood co-wrote, and again, some fantastic soloing! The inclusion of 'Wonderous Stories' also surprised me, as neither of the duo featured on the track or on the 'Going For The One' album; that said, it is well performed. It's also nice to hear 'The More We Live' from the 1991 'Union' album, which Sherwood co-wrote, and 'No Way We Can Lose' from 1997's 'Open Your Eyes', as Yes haven't played the pair since the respective tours. World Trade's 'Say Goodbye' gets a look in, before 'Roundabout' draws proceedings to a close. This version sounds as if the pair are on drugs, as it's a really speeded up! The DVD element is where the viewer is let down; it is poorly filmed, often out of focus and darkly lit. There are several snippets of the cities where the duo played and the crowd are extremely polite, but do not interact. However, overall this is a satisfying package for Yes and Billy Sherwood fans.